Here is a comparison between two flagship devices from HTC and NKOB, OnePlus. 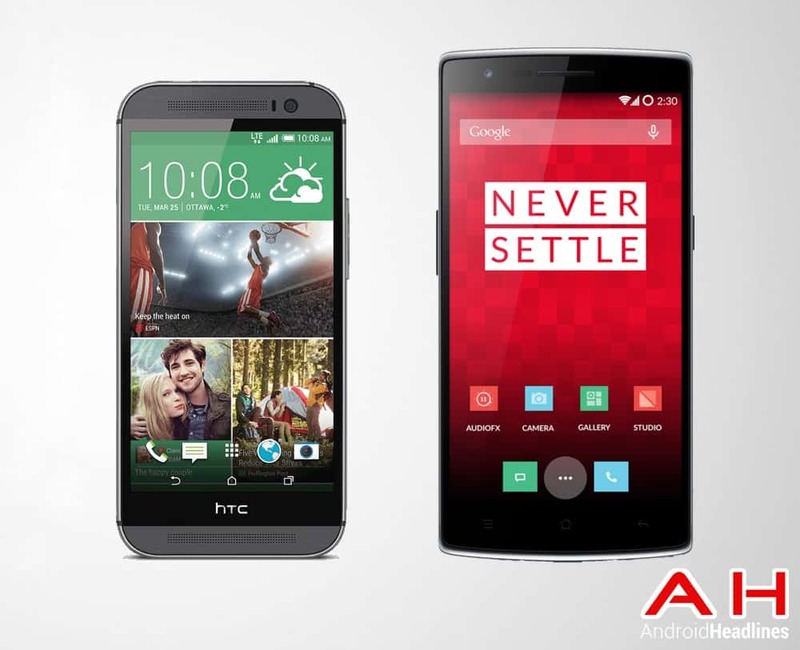 The HTC One M8 has been on the market for about a month and the OnePlus One is hitting the market now. Both manufacturers put a lot of emphasis of design and looks – they put as much thought into how their device looks and feels to the customer as much as they worry about the specifications. That is about where the similarities end – the screens are both of the LCD variety, but the OnePlus uses a slightly larger display. They both use a Qualcomm Snapdragon quad-core processor, however, the OnePlus uses a slightly faster, true 801, not the ramped up 800 version used in the HTC One M8. Both devices also take their camera’s seriously, but also in a different way. They both also have dual stereo speakers, but once again, slightly different implementation . So while they are similar in certain ways, they are also ‘slightly’ difference in many ways. Take a look at the side-by-side specifications below and then we will look at what makes these two flagships different from each other and then we will be ready to select a winner to this comparison. 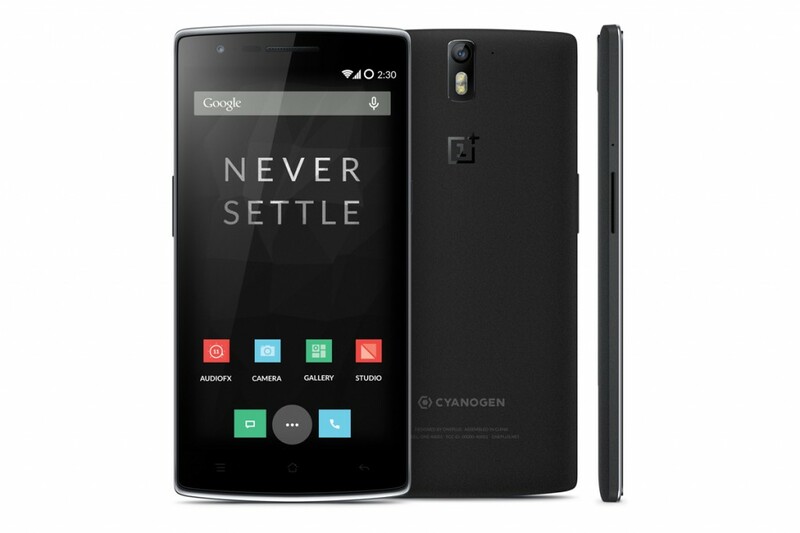 The new company OnePlus has hit the ground running with their new flagship, the OnePlus One. It is a handcrafted masterpiece, much like the HTC One M8. The One has a half-inch larger display than the HTC One M8, using a 5.5-inch LCD Full HD display with 1920×1080 resolution amounting to 401 pixels-per-inch (ppi). The processor is the new Qualcomm Snapdragon 801 clocked at 2.5GHz – Qualcomm’s most up-to-date model, also used in the new Samsung Galaxy S5. It is not too different from the HTC One M8′s processor, but it is slightly faster all around. It also carries 3GB of RAM rather than the 2GBs found in the HTC One M8 and they both offer 16GB of internal memory – the OnePlus One jumps to 64GB with no microSD card for expansion. The OnePlus One packs a 13MP, six lens main camera, and the sample pictures so far look very impressive and the OnePlus has a 5MP front-facing camera for clear video chatting and great selfies. The One is slightly larger, but they weigh in at almost the same – 162 grams versus 160 grams for the HTC One M8. The battery of the One is also larger – 3,100mAh versus 2,600mAh and should help it stay off the charger. 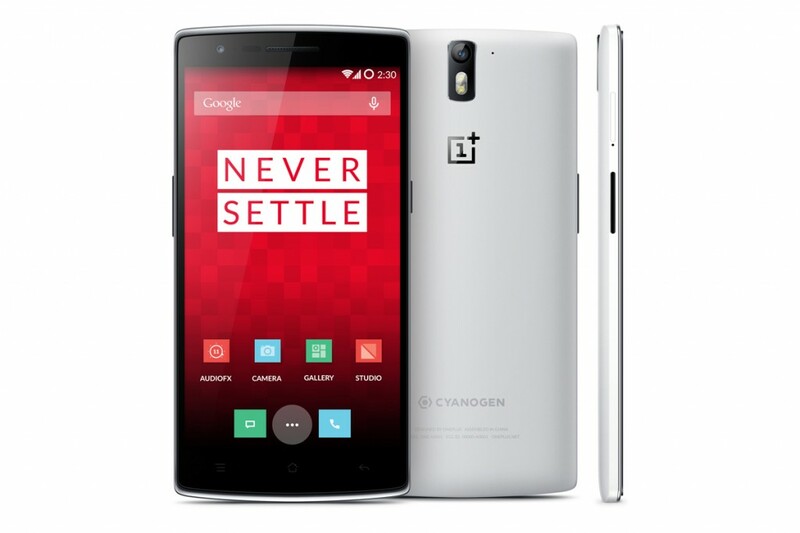 Another plus for the OnePlus One is the cost of the device…$299 for 16GB and $349 for the 64GB model. Those are prices that will really give the Nexus 6 a real run for its money. If the OnePlus One has a downside, it would be that it only works on AT&T and on most T-Mobile bands – so there is no way to use it on Verizon or Sprint. The HTC One M8 is also a beautiful device, made out of aluminum that is slightly curved on the back to make it comfortable to hold in your hand. It is also known for its dual, front-facing stereo speakers, as well it should…the HTC One M8 has the best sounding speakers of any smartphone on the market. The OnePlus One also has dual stereo speakers mounted on the bottom of the device – good placement, but not near the size or sound of the HTC One M8. The third area of interest is the camera – it is the same 4MP UltraPixel camera found in the M7 from last year, however, they added a second camera, called a Duo Camera. It is an interesting setup as that second camera is used, not to take pictures, but to help with special effects and to help given them depth. It also has a 5MP front-facing camera, so they are on equal ground here. The low-light pictures are better than most, but the normal daylight pictures are okay…just don’t plan on blowing any of them up. The HTC One M8 does offer a microSD slot to increase the internal memory by up to 128GB. The battery is smaller than the OnePlus One – coming in at only 2,600mAh versus 3,100mAh. The price on a two-year contract is good, but when you compare the off-contract price of $600 versus the $299 – $349 of the OnePlus One, it also is way overpriced. Okay, another victory, based on specifications, has to go to the new OnePlus One – except for the lack of front speakers, the OnePlus One is every bit as nice looking as the HTC One M8. 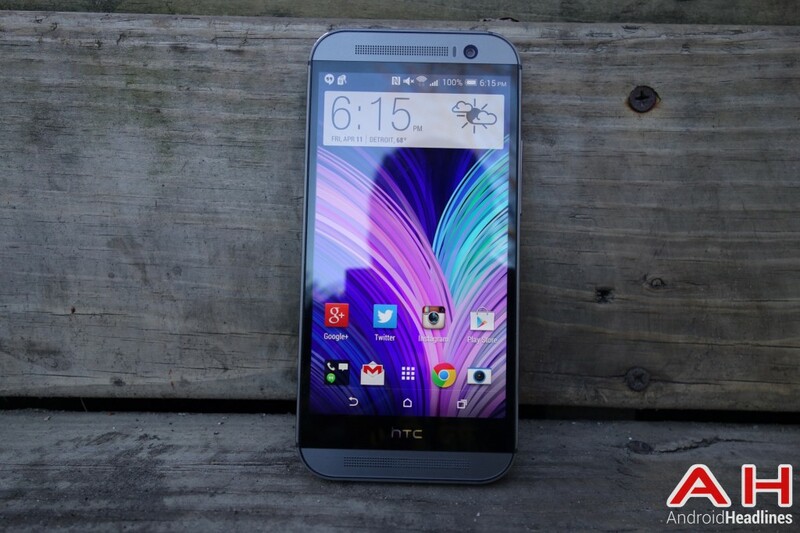 The entire front looks like it is display and the back and sides are curved and as nice looking as the HTC One M8. The display is slightly larger, processor is slightly better, the 3GB of RAM is slightly more, and the camera is slightly better – and so the OnePlus One is also slightly better. Both devices use Android 4.4 KitKat – the HTC One M8 adds their Sense 6.0 UI and the OnePlus One adds CyanogenMod 11S, a modified version of the very popular ROM among those that root their devices and it promises quick software updates. The speakers are not as good, and there is no room for a microSD card, but for the bucks, you just cannot beat the OnePlus One. Right now, its only downside is the lack of use on Verizon and Sprint’s network. Please let us know what you think on our Google+ Page – are you waiting to checkout the newest phone from China or are you sticking with your love of the HTC One M8…as always, we would love to hear from you. 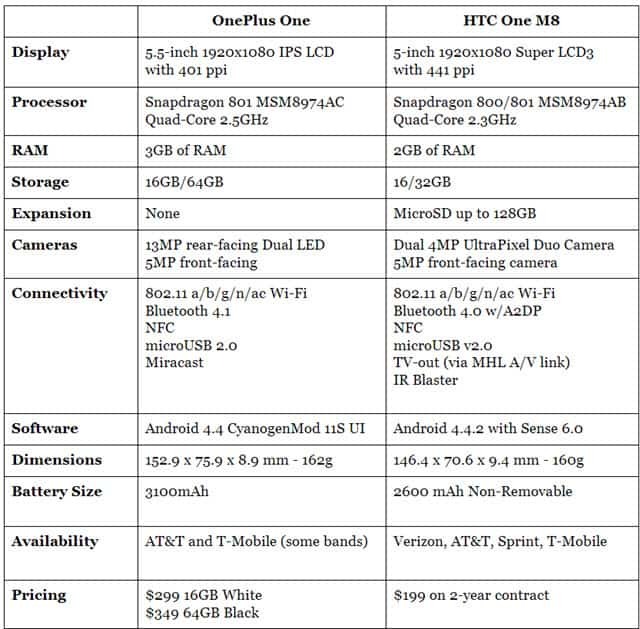 The post Android Phone Comparisons: OnePlus One vs HTC One M8 appeared first on AndroidHeadlines.com |.